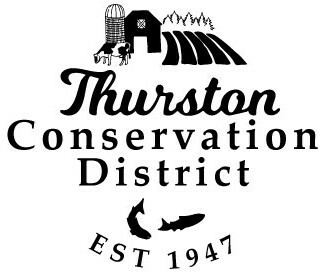 The Thurston Conservation District hosts the South Puget Sound Regional Envirothon competition annually each spring at the Billy Frank Jr. Nisqually National Wildlife Refuge. Sign up for relevant notifications here, or register a team here. 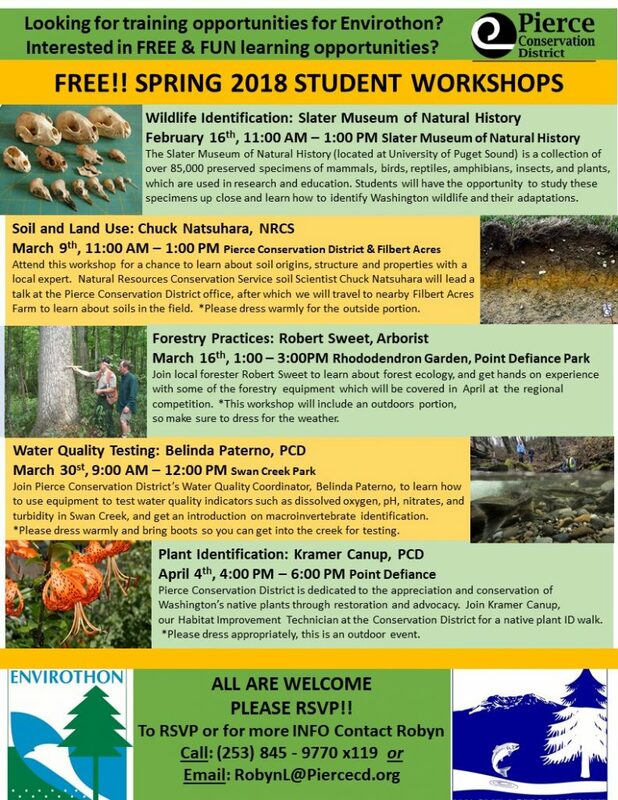 Envirothon is a hands-on, outdoor environmental science competition for high school students. Students compete in teams of five to demonstrate their knowledge in Soils, Forestry, Aquatics, Wildlife, and a current issue topic. Billy Frank Jr. Nisqually Wildlife Refuge in Olympia. Students grade 9-12 from Mason, Lewis, Grays Harbor, Kitsap, Thurston, and Pierce Counties. Students must be from the same school, home school group, or local organization (ex. FFA). The winning team from EACH county gets to attend the Washington State Envirothon. Participation in Envirothon is a huge boost to a student’s résumé or college application. Students get to be part of a team and meet other young people from around the south sound who are interested in environmental science. The competition is proctored by professionals working in natural resources, giving students exposure to careers in the field. Teams get access to workshops on relevant environmental topics preceding the event. The winning teams get to attend the state Envirothon, where they’ll compete for a chance to attend the international competition in Idaho. Registration for the 2018 competition is closed. If you wish to be put on the mailing list to receive updates about dates and workshops for the 2019 competition, email us or fill out this quick form. Once you have formed a team and are ready to register for the regional competition, you may fill out this online form or print this PDF form and return it by email or fax (360-236-0941). We had such a fun day celebrating environmental science, our natural resources, and the spirit of competition with 64 students and educators from our community. It was a lovely, sunny day for students to explore the unique estuarine habitat of the Refuge and meet some of its local wildlife – including a mink and young bald eagle! A big thank you to Pierce Conservation District for co-hosting with us! Thank you also to our amazing volunteers and our local sponsors, the Chehalis Tribe and Furniture Works, and the Billy Frank Jr. Nisqually National Wildlife Refuge for letting us spend the day in your beautiful space. We truly appreciate you all for your support of environmental education for our community’s youth! And of course the biggest thank you goes to the students for their enthusiasm, teamwork, competitive spirit, and exemplary representation of their schools. Congratulations to all of you!